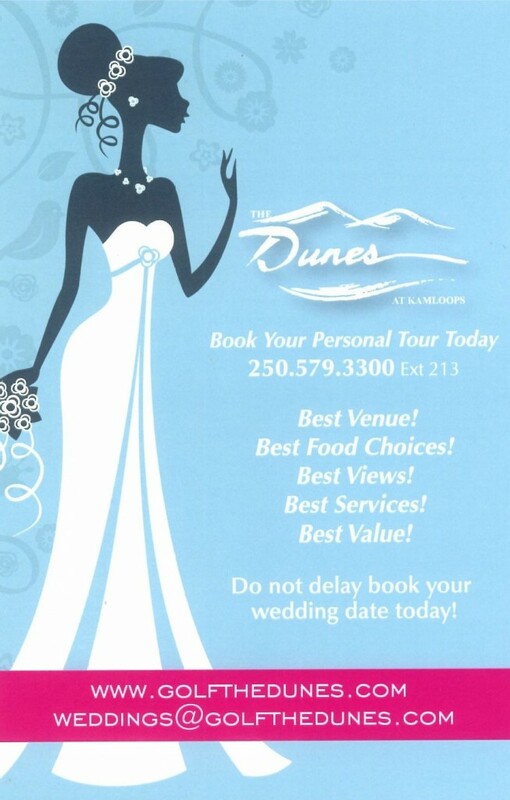 A wedding at The Dunes Golf Course, Kamloops sets a new standard in romantic elegance. From bridal showers at afternoon tea to martini nights and golf outings for the gentlemen, we offer a breathtaking wedding venue and comprehensive wedding services for uniquely perfect celebrations. Come experience the lap of luxury, reasonably priced. The Dunes Golf Course Clubhouse is comprised of professional staff members that pride themselves on unparalleled attention to detail and an unmatched standard of service excellence. Packages are designed to be straight forward and easy to understand without any surprises. Elegantly appointed, The Dunes Golf Course Clubhouse Grand Ballroom will accommodate 200 guests with a dance floor, and The North Terrace for cocktails and socializing will accommodate 150 guests. Every seat in the Grand Ballroom and the North Terrace come with exceptional panoramic views overlooking our award winning golf course and the splendor of the North Thompson region. Working with you or your wedding consultant, our on-site wedding professional will be your dedicated contact for all of your wedding planning needs while at The Dunes Golf Course.